Colin Axford was a reassuring voice in the water for children learning to swim until a serious back injury forced him out of the pool. Determined to remain a positive influence in young lives, the father-of-three and former swimming instructor turned to youth work. 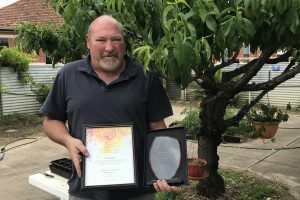 Seven years later, Colin is the South Australian Youth Worker of the Year. Awarded the honour at Parliament House this month, Colin was recognised for his `exemplary youth work practice and commitment to the principles of primary client empowerment and cooperation’. Known for his calm and sturdy influence, Colin works with young people aged 12 to 24 years engaged with Centacare’s Integrated Youth Substance Misuse Specialist Service (IYSMSS), based at Alban Place, Stepney. The service provides residential intervention for clients wanting to make positive change to their alcohol and drug use. Staying for up to eight weeks, they access a range of supports including life skills training. As it was in the pool, Colin says his approach is simple: “I just talk to them and try and be a father figure. Some of them have never had a person in their life like that to nurture their interests and just listen to them and laugh. In the woodwork area out the back, Colin points to a chessboard the young people carved from a tree stump. The board represents accomplishment and perseverance, he says. “Sometimes they’ll give up on project if it didn’t work the way they wanted, so I’ll get it back to a manageable state to give them hope and encourage them to have another go. “It’s tough to watch them sometimes. A lot of them have challenges with friendships – especially if their mates are still using – or their family members, which we have no control over. In return for the hope he gives clients, Colin is rewarded with smiles and laughter – and the occasional hug. “It’s those two things, the smiles and laughter,” he says of what drives him each day. “When I was a swimming instructor, I loved seeing the young kids go from being scared of getting in the water to jumping in the deep end by the end of the week. They’d come up with the biggest smile on their faces. IYSMSS manager Gill Bridgen said Colin was a crucial part of the team: “Colin has been with Alban Place since we commenced in 2015 and has played a significant part in our program developing to what it is today.